Game description: SpyHunter: Nowhere to Run takes the Spy Hunter franchise where it's never gone before: on foot. 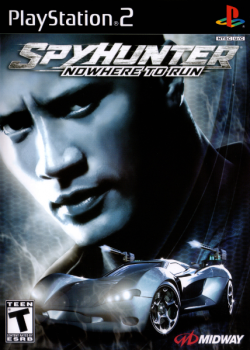 Featuring action superstar Dwayne 'The Rock' Johnson as government super-spy extraordinaire Alex Decker, players for the first time ever can step out of the Interceptor and straight into third-person action, utilizing The Rock's physical prowess by taking down enemies with intense melee combat moves. In Nowhere to Run, the evil NOSTRA corporation returns, this time with a plan to steal the latest government technology including the world's most sophisticated spy vehicle, the Interceptor, and it's up to Alex to stop them. This page was last edited on 17 December 2015, at 20:18.